In the early days of baseball, a multitude of changes occurred over time in relation to how far the pitcher stood from the batter when he released the ball. Originally, the pitcher was positioned behind a line that was 45 feet from the center of home plate. As time went on, rules changed, and the line was modified to a box that was moved back to 50 feet from home plate with the pitcher working from the back line five-and-a-half feet further back. In 1893, the National League replaced the pitcher’s box with a rubber slab 12 inches by four inches that was set in the ground 60 feet, six inches from the back of home plate. Batting averages had been on the decline for years and the extra distance was meant to handicap the pitcher, thus making the game more exciting. The added distance had its desired effect; more than 30 batters hit .300 or better in 1893, after nine reached the mark the previous year. On Wednesday, August 16, 1893, Bill Hawke of the Baltimore Orioles became the first pitcher to toss a no-hitter from the new distance, defeating the Washington Senators 5–0. Based on his lackluster major-league pitching record up to that point, the 23-year-old right-hander was an unlikely candidate to achieve this milestone. The Delaware native started out his amateur career as a catcher and third baseman. In 1890, Hawke began pitching on a fulltime basis for a team from Elkton, Maryland. Bill signed his first professional contract with Reading of the Pennsylvania State League in the spring of 1892 and in late July signed with the St. Louis Browns. Hawke finished out the season with the Browns, going 5–5 with a 3.70 earned-run average. St. Louis released him the next season after he was hit hard in his first start. Hawke signed with Baltimore in June and his work with the club had been creditable but not spectacular during the weeks leading up to his no-hit game. It was a clear, humid summer day in Washington with temperatures ranging in the high 80s when the Baltimore Orioles took the field against the Washington Senators. Neither team had been setting the league on fire. Baltimore was struggling, 12 games below .500, and the Washington club, which was floundering in last place, had 33 wins and 59 losses. The game was played at Boundary Park, which was on the future site of Griffith Stadium. The umpire was Bob Emslie, who had been an outstanding pitcher, winning 32 games for Baltimore in 1884, and now in his fourth year as an umpire. 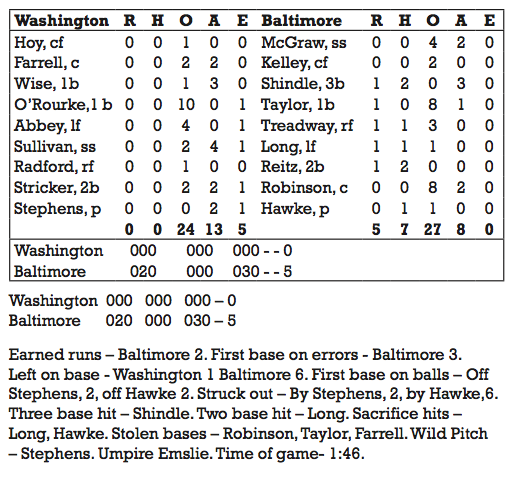 The starting pitchers were Hawke for Baltimore and Ben Stephens, who was making his debut with the Senators. Stephens had been a rising star in the Midwestern leagues before signing a major-league contract with Baltimore in July 1892. He had won 18 and lost seven for the Western League champion Columbus team before joining the Orioles. Washington’s left fielder, Charles Abbey, also made his major-league debut in this game. Washington batted first and lead-off hitter William “Dummy” Hoy drew a base on balls off Hawke. Hoy attempted to steal second base, but Orioles catcher Wilbert Robinson threw him out. Washington’s only other baserunner was catcher Duke Farrell, who walked in the fourth inning but was left stranded at second. Hawke was backed by a number of fine defensive plays. Orioles third baseman Billy Shindle and shortstop John McGraw made a number of outstanding stops and throws that cut down batters. Hawke himself hustled over and covered first base on a sharply hit ball to first baseman Harry Taylor. Baltimore outfielders Joe Kelley and George Treadway also made clutch grabs that helped preserve Hawke’s no-hit bid. The Orioles scored two runs in the second inning. George Treadway singled and advanced to second on a passed ball by Farrell. Jim Long sacrificed Treadway to third and he scored on a single by second baseman Heinie Reitz. The next hitter, Wilbert Robinson, drilled a groundball that caromed off Washington shortstop Joe Sullivan and ended up in center field. Reitz advanced to third. Hawke hit a sacrifice fly to center that sent Reitz home. Stephens settled down after that and the Orioles didn’t score again until the eighth inning. Shindle reached on an error by Washington second baseman Cub Stricker and Taylor walked. Both runners scored when Jim Long smashed a double to left field, and Reitz followed with a double to right that plated Long. Stephens deserved a kinder fate, working all nine innings, allowing seven hits and just two earned runs. The 25-year-old struck out two (the first two batters he faced), walked two, and uncorked a wild pitch. Stephens also went winless in his next five starts, and was released after appearing in three games for the Senators in 1894. He returned to the minors and pitched for the Milwaukee Brewers of the Western League for two seasons before dying of tuberculosis at the age of 28 on August 5, 1896. Hawke’s sinkerball kept the Senators off-balance for the entire game. He struck out six and walked two. 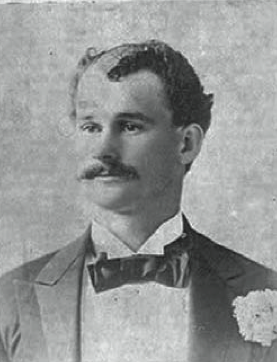 Hawke finished the 1893 campaign with an 11–17 record (including one loss with St. Louis). He hit his stride the next season, going 16–9 for the National League champion Orioles. Sporting Life said of him on October 6,1894, “He is what is called a ‘phenom’ and pitches a very swift, puzzling ball, difficult to fathom.” Unfortunately for Hawke, he suffered a broken wrist before the start of the 1895 season and never won another major-league game. He made a short-lived comeback in the minors in 1899 but was never the same pitcher. Like his pitching opponent on August 16, 1893, Hawke died young, a victim of cancer at the age of 32 on December 11, 1902. This essay was originally published in "Inventing Baseball: The 100 Greatest Games of the 19th Century" (2013), edited by Bill Felber. Download the SABR e-book by clicking here. It also appeared in SABR's "No-Hitters" (2017), edited by Bill Nowlin. To read more articles from this book, click here.